The human fascination and investigation of the stars is sometimes limited by insufficient measuring equipment, which has been the case so far when observing bright stars through high performance telescopes. A solution to this was presented by an international group of astronomers lead by Tim White from the Stellar Astrophysics Centre (SAC) by Aarhus University. The results were published in the latest edition of the Monthly Notices of the Royal Astronomical Society. The Kepler Space Telescope is designed to observe a lot of stars at once which compresses the possibility for further investigation in the brightest shining stars. The new technique is called halo photometry and it presents a new algorithm for measuring the true stellar variability. The contribution of each pixel is weighed to find the right balance where instrumental effects are cancelled out. 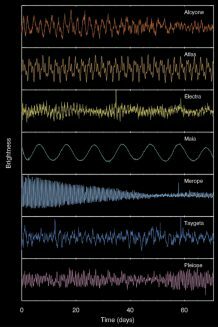 Variations in the light is then registered and used in asteroseismology to study the inside of the stars. 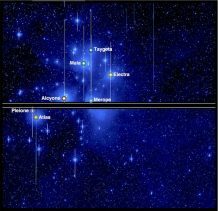 The authors of the article have used the halo photometry technique to observe the seven brightest stars in the Pleiades star cluster. Previous studies have shown that the seventh star, Maia, belongs to a class of stars with abnormal surface concentrations of some chemical elements such as manganese. The authors’ observations showed that the star also differs in its pulsations, which can be seen on the picture below. To find out whether these variables were related, a series of spectroscopic observations were taken using the Hertzsprung SONG Telescope. For further information visit the Aarhus University website.